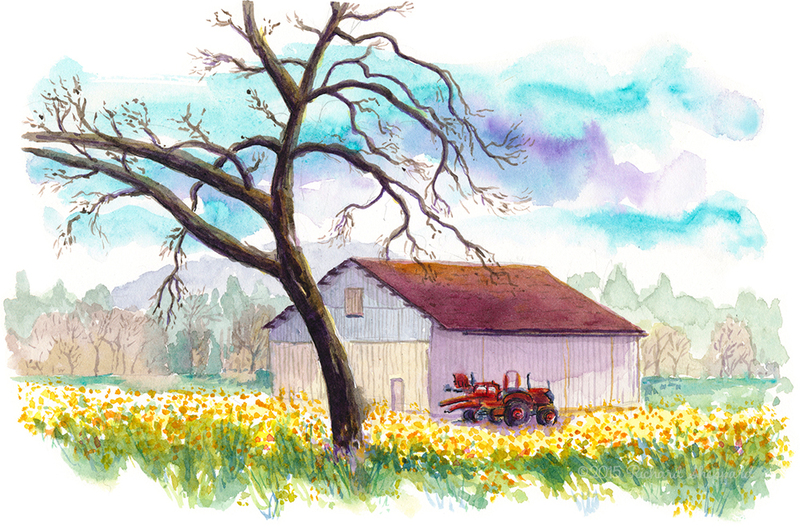 With the help of December rains, mustard is in full bloom all across Sonoma County. After three years of putting off painting this scene, today I finally took the time to sketch it with my good friend Phil McDonel. January 27, 2015 Richard SheppardComments are off for this post. October 22, 2014 October 23, 2014 Richard SheppardComments are off for this post. This year’s harvest at Chateau Montelena is now completeÂ and the resulting wine is fermenting in tanks or aging in barrels. From what I’ve been told, the overall quality and yield was equal to or better than last year’s bumper crop. I’m looking forward to tasting these new vintages when they become available. October 26, 2013 November 24, 2013 Richard SheppardComments are off for this post. October 5, 2013 November 24, 2013 Richard SheppardComments are off for this post. When Helen arrived at Chateau Montelena it was about 5 pm. In those days, grapes werenâ€™t picked at night like they are today because they didnâ€™t have lights for the vineyard. Upon her arrival, Helen asked for the weigh scale. 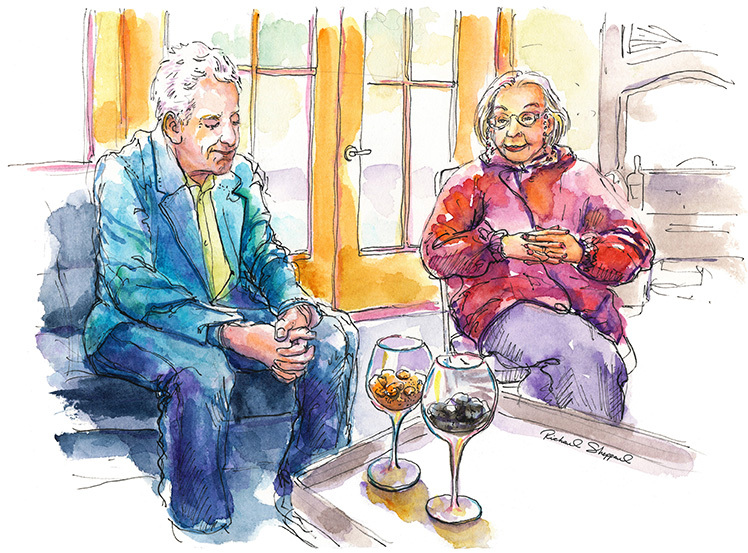 Mike Grgich searched but came up empty, so on subsequent trips, the grapes were weighed on the Witkeâ€™s scale in Healdsburg until all the trips had been made and the harvest was completed. 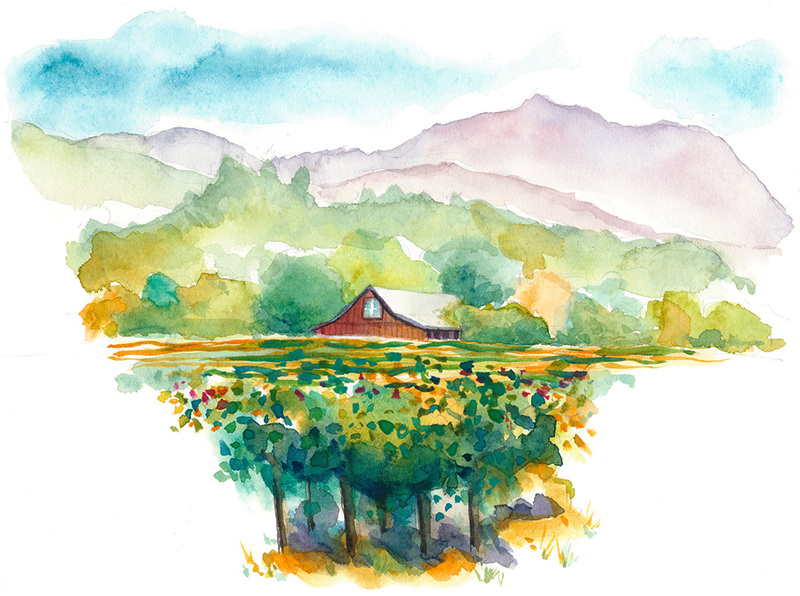 Back in 1964 when the Bacigalupi family planted six acres of Chardonnay along with four acres of Pinot Noir on their Westside Road ranch, many people thought this a risk, as the conventional wisdom and the market still leaned toward prunes. â€œAt the time, Iâ€™d never heard of either of those two types of grapes,â€ says Charles, â€œand I had to write the names down so I wouldnâ€™t forget them.â€ But in 1976, the Bacigalupis gained widespread recognition as growers, when the 1973 ChÃ¢teau Montelena Chardonnay, made with 40% of the Bacigalupiâ€™s fruit, won the famed Judgment of Paris tasting over many highly acclaimed French wines. The Judgment of Paris consisted of six California Chardonnays along with four French white burgundies that were selected for a blind tasting event in Paris by Steven Spurrier, an English wine merchant. Top French wine experts judged and ranked the wines, and the 1973 Chateau Montelenaâ€™s Chardonnay came out on top, making history. There was also a red blind tasting featuring California Cabernet Sauvignon vs. French Bordeaux in which Napaâ€™s Stagâ€™s Leap Wine Cellarsâ€™ Cabernet took top prize. 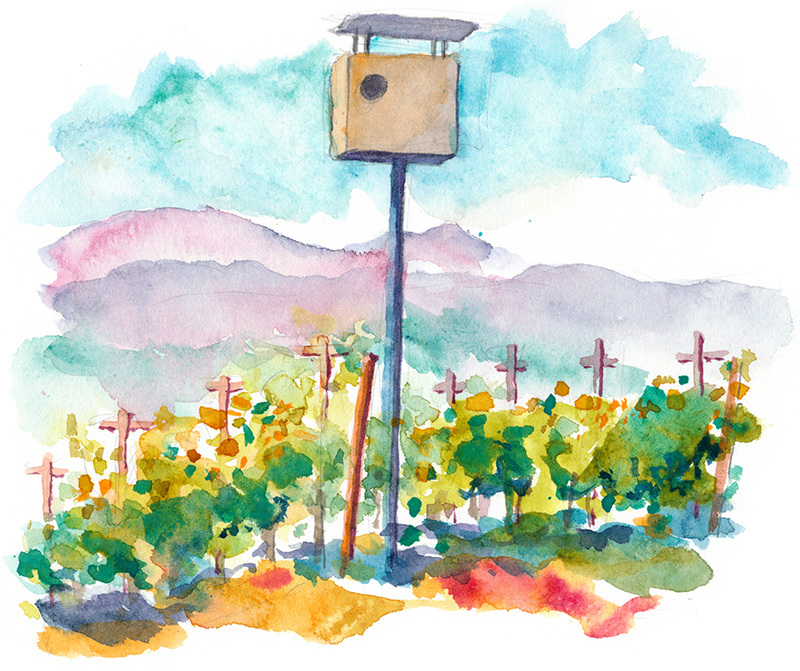 This single event helped to change the worldâ€™s perception of California wines. Grgich made 1,800 cases of the 1973 Chateau Montelena Chardonnay using 14 tons of grapes from the Bacigalupis, 20 tons from Henry Dickâ€™s vineyard in Alexander Valley, and 5 tons of grapes from Napa Valley growers John Hanna and Lee Paschich. Today, the Bacigalupi vineyard still produces fruit, but at about half its 1973 levels. Even so, the family plans to keep the famed vineyard for as long as it produces grapes. September 21, 2013 November 24, 2013 Richard SheppardComments are off for this post. So why was the Judgment of Paris so important? Six California Chardonnays along with four French white burgundies were selected for a blind tasting event in Paris in 1976. Top French wine experts judged and ranked the wines, and the 1973 Chateau Montelenaâ€™s Chardonnay came out on top, making history. There was also a red competition featuring California Cabernet Sauvignon vs. French Bordeaux in which Napaâ€™s Stagâ€™s Leap Wine Cellarsâ€™ Cabernet took top prize also. In Retrospect, the Judgement of Paris was seminal, but at the time, no one was talking about it and it wasnâ€™t until years later that we even heard about it. There just wasnâ€™t much fuss over it at the time. But, as history has shown, it changed the way people viewed California wines. September 7, 2013 November 24, 2013 Richard SheppardComments are off for this post. I had the pleasure of working in the cellar at Robert Mondaviâ€™s Winery back in 1990. At the time, I had just moved to California and a friend of mine Archi, introduced me to Dave the Cellarmaster at Mondavi. After a short conversation, I was hired on the spot. Maybe he liked the fact that I had ambitions to be an artist, I donâ€™t know, but I got the job. I found working the harvest so thrilling, I almost didnâ€™t finish school. But I knew returning to college was the right thing to do and if I still wanted to work in the wine industry, it would be there when I got through. TodayÂ Iâ€™m glad I finished school because now I get to enjoy both painting wineries and drinking their wine! August 27, 2013 November 24, 2013 Richard SheppardComments are off for this post. I had a great time last weekend with the Ready, Set, Sketch! group. There were 9 participants at different skill levels and all eager to sketch. 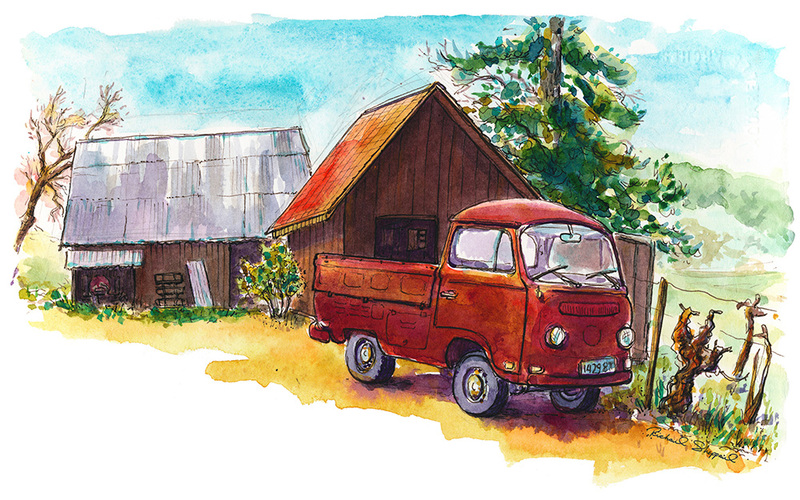 We started off at the Dry Creek General Store, sketching from across the road. It was a foggy morning but it cleared about 11am. 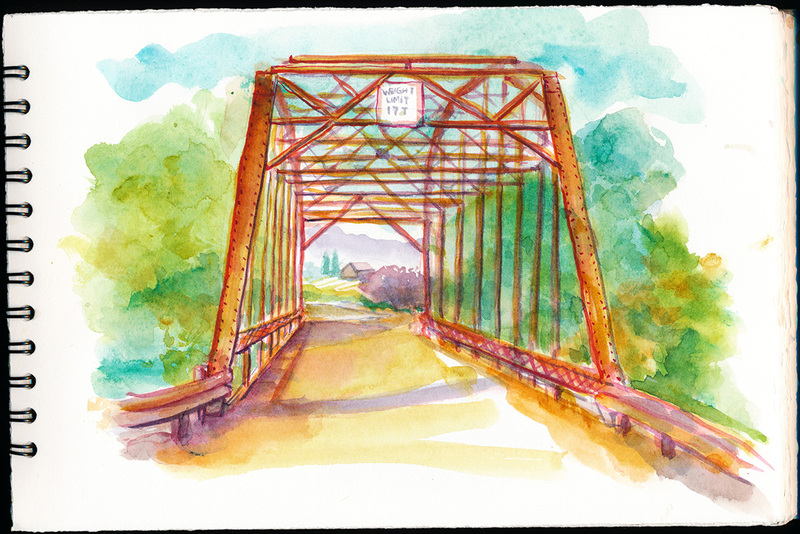 At noon, we purchased some sandwiches from the Dry Creek Store and headed down the road to Dry Creek Vineyards which is one of the best picnic spots in the area, complete with shade trees, umbrellas, and picnic tables. 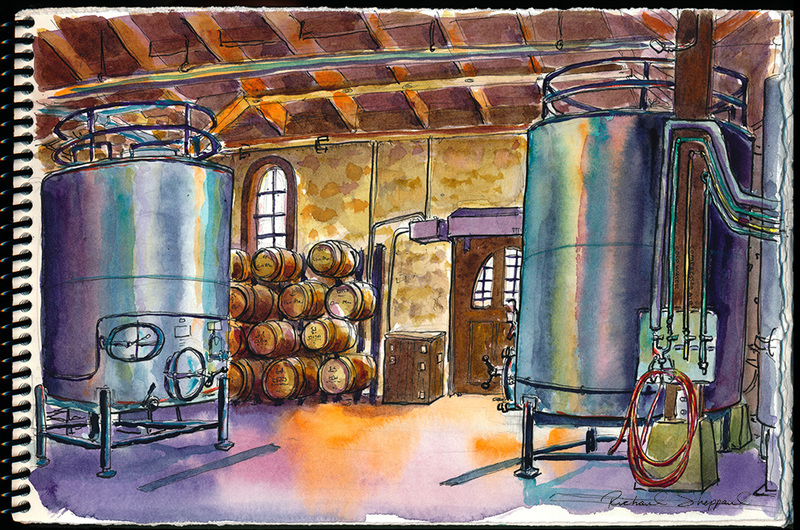 Following a second sketch of the winery, Phil and I finished the day by tasting some of Dry Creek Vineyard’s wine. I especially liked their Chenin Blanc and Maritage. August 13, 2013 March 17, 2016 Richard SheppardComments are off for this post.